The small city of Cortina in the province Belluno in the region Friuli-Venetia is only 45 minutes by car away from your Leitlhof Hotel in Innichen. As a well-known winter sports region Cortina offers skiers and snowboarders a joyful atmosphere. During the summer the Cortina mountain sports centre is one of the frequently visited hiking destinations in South Tyrol. In 1956 the Winter Olympics were held in Cortina d’Ampezzo and took the competitions to a new level. Not just new sporting heroes like Toni Sailer or Sixten Jernberg made their name here. Also the USSR finished first at its first ever appearance at the Olympic Games. The games in Cortina d’Ampezzo were also the first to be shown on television. 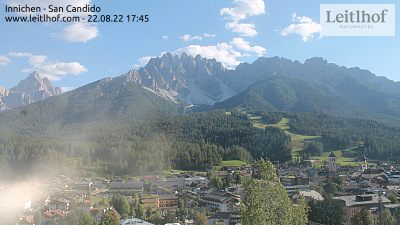 The ski jumping hill and the ice hockey stadium are monuments from this time and still distinguish the town of Cortina. Not only sportsmen and women enjoy a trip to Cortina, various other sights and cultural events characterise the flair of the Venetia. In the heart of Cortina you will find various great exhibitions from modern art and cultural history to folklore. Marvel at the stunning collections of sculptures and paintings from the 20th century at the museum of modern art. Well-known artists like Morandi, Depero and Rotella are shown here. Since 2012 a very special highlight at the museum has been the collection of over 70 masterpieces by the futurist Mario Sironi. The exhibition repertoire gives a good overview over modern Italian art. Of course you will also find the world’s greatest painters at the Rimoldi-Museum, like Parblo Picasso. Spend thrilling hours with the, up to this day, biggest collection of fossils on the Dolomite Alps. If you are interested in ancient macrodontia, or aquatic invertebrates or if you want to know what that is, then visit the very interesting exhibition in the paleontological museum in Cortina. At the folklore museum you will get an idea of the live and work of ancient times. Typical tools and equipment as well as traditional costumes can be seen in this exhibition. Take a free hike through the rough rocks at the Falzarego Pass and the Lagazuoi on easy to moderate sightseeing paths. Information boards will provide interesting facts about the important sights and the stunning witnesses of World War I during your hike. The talus of the demolition of parts of the Lagazuoi summit by the belligerent powers as a last possibility for a storming is a continuous company on your sightseeing tour. In the fortress on the Valparola Pass you will find the museum of the Great War, where soldiers’ weapons and gear can be seen from up close, but also general tools from the everyday life are shown in the museum in the fortress. Stroll through Cortina’s alleys and marvel at the various impressive buildings, like the Parrocchiale San Filippo e Giacomo church from the 18th century with its frescos by Franz Anton Zeiler, who has decorated many churches in Hochpustertal with his frescos. Especially interesting is the steeple made of dolomite blocks. In the middle of the Cortina main square you will find a memorial for Angelo Dibona, the Ampezzaner mountain guide and Dolomite pioneer. Many via ferratas on the Dolomites are named after him: The Dibona Edge on the Große Zinne or the Dibona via ferrata starting at the Cristallo Massif. Another sight is the Chiesa di San Nicolo from 1226. This church is considered to be Cortina’s oldest church. Visit the Clinque Torri area near Cortina, which was occupied during the war. You will reach the open air museum easily and quickly with the cable car, the sightseeing tour is free and takes between 15 minutes to 3 hours, depending on your individual interests. If you are tired you can just sit and watch the climbers on the “Fünf Türmen” (Five Towers). The Five Towers are, together with the Drei Zinnen peaks, the climbing highlight of the Dolomites. Unlike the Drei Zinnen in the High Alps, they are easier to reach and not quite as demanding to climb. If you've come for the climbing, you can look forward to some of the most panoramic views of the Alps. Visit the Hochpustertal holiday region and enjoy fascinating trips to Cortina, the Olympic city of 1956. Send your no obligation holiday enquiry to the team at the Leitlhof Feel-Good Hotel in Innichen or contact us by telephone, call +39 0474 913440.